We are one of the dependable Suppliers of high quality Manual Vertical Bandsaw Machines Exporters, based in India. The blade of our Manual Vertical Band Saw Machine operates in the vertical plane and is ideal for contour cutting. We design and fabricate the entire range of Automatic Vertical Band Saws by combining qualitative raw materials with the latest technology. 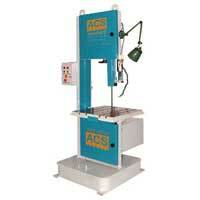 We are well positioned amid the leading Manual Band Saw Machines Manufacturers.